Download the provisional patent cover sheet, United States Patent and Trademark Office, or USPTO, form PTO/SB/16 from the USPTO website. You can chose either the pdf format, which you can then print out and mail in to the USPTO, or use the EFS-Web version of the form. With the EFS-Web version, the information you enter on the form is automatically entered into the USPTO system. Fill out the cover sheet. You will need to provide the names of all the inventors and their residences, the title of the invention, as well as information concerning any U.S. Government agency that has a property interest in the invention. You will need to sign this document. Prepare a written description of the invention. This description must be written in enough detail as to enable anyone who is skilled in the industry related to the invention to make and use the invention for themselves. Prepare any drawings needed. 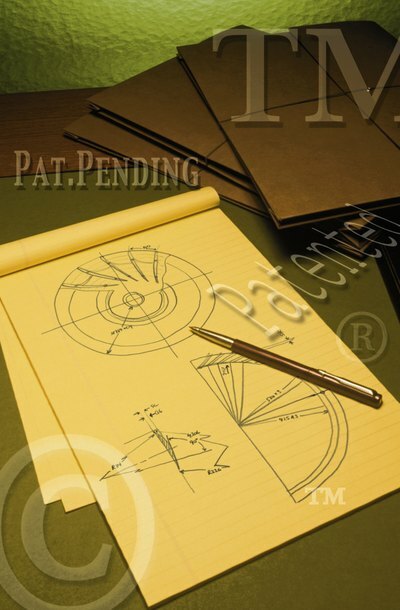 You need to submit drawings of the invention if they are necessary to understanding how the invention is made or used. You need to submit drawings only if it is possible to illustrate the invention. Submit the filing fee along with the cover sheet, invention description and drawings via the EFS-Web system, or by mailing hard copies to the Commissioner for Patents, P. O. Box 1450, Alexandria, VA 22313-1450. The filing fees change each year and may be paid via check, money order, credit card, electronic funds transfer or by transfer from a USPTO deposit account. As of 2011, the filing fee for a provisional application is $250. Small entities – universities and businesses with few than 50 employees – pay $125. If the application, which consists of the cover sheet, description and drawings, is greater than 100 pages, you will need to pay $310 for each additional 50 pages, or $155 for a small entity.